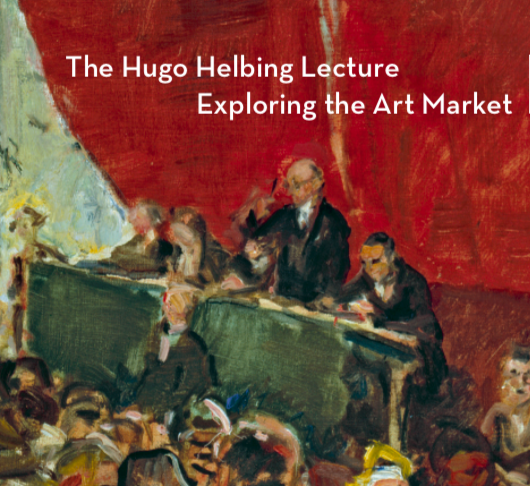 You are cordially invited to the fourth Hugo Helbing Lecture: Exploring the Art Market on May 8th, 2019 in Munich, whose the speaker, Prof. Michael Kauffmann (Director Emeritus, Courtauld Institute of Art) will be introduced by Prof. Dr. Mirjam Zadoff (Director NS-Dokumentationszentrum Munich), PD Dr. Christian Fuhrmeister (Zentralinstitut für Kunstgeschichte, München) and TIAMSA Chair Dr. Johannes Nathan. The Lecture will be held at the NS-Dokumentationszentrum Munich, followed by Drinks at the nearby Zentralinstitut für Kunstgeschichte. Abstract: This lecture will centre on about ten individuals who were friends and colleagues of the speaker’s father, Arthur Kauffmann. Formerly director of the Frankfurt branch of the auction house Hugo Helbing, Kauffmann emigrated with his family to London in 1938. England was also the chosen destination of Kauffmann’s colleagues such as Grete Ring, Alfred Scharf, Franz Drey, Herbert Bier and Robert Frank. In discussing the effects of emigration on their biographies, the talk will draw upon personal memory as well as knowledge of these individuals’ careers. At the same time, the lecture will also reflect on the impact of refugee dealers on the art market in England. The London dealers were indeed very welcoming to the new arrivals at the time, a fact which greatly helped the latter – who considered themselves as refugees rather than exiles – to take root.